I am almost two months removed from my race at Chicago and I'm slowly, but surely returning to activity after thoroughly enjoying my off season. Just recently I hopped back on my bike a few times and I experienced the pure joy that biking brings me now (crazy, because I used to kind of hate my bike!). I've touched on some of the lessons learned from my injury here and here, but I'll expand a bit on some of the other things I've learned over the season as well. The journey was the most important part of my summer. The races are the icing on the cake, and well, this summer, I didn't really have a cake to ice. Being injured forced me to really think about why I do triathlon, and while I do love to race, I realized that there are about a hundred reasons beyond racing that I swim, bike, and run. The injury forced me to think day in and day out about my WHY. Some days, that why was a dim and distant speck on the horizon, a flickering light that was close to burning out. Other days, I dug deep and found within me a passion for challenging myself, going outside my comfort zone, and continuing to improve my weaknesses. 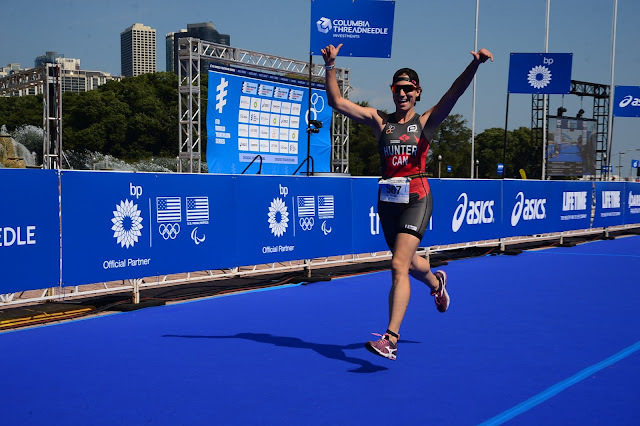 Triathlon is a lifestyle choice, it's about trying new things, enjoying nature, building friendships over a shared love for the outdoors and sport, and nurturing my soul. I had so much fun watching my friends improve this summer. I didn't quite get to train with them as much as I have in the past, but we had a ton of fun going to races together. The friends that I have made through triathlon continue to inspire me and motivate me every single day. The details matter a lot in triathlon, from training to race day. Whether it's fitting in my muscle activation drills before heading out the door for a run or placing my bib in my helmet so I don't forget it during transition, I gained a newfound appreciation for doing the little things right. It can take only a few seconds to do some things, but a lot longer to fix the mistake of skipping them. Patience has never been my strong point, but I had to really fine tune my skills in waiting and even learning to enjoy slowing down this summer. Recovering from injury is not a process to be rushed. Being kind and gentle to myself was really important throughout the journey. Patience has helped not only in recovering, but in remembering that results will come with time and that we can't really expect to see the fruits of our labour overnight. It was a good summer, full of lessons and full of fun. Now that I'm quite removed from the season, I think I have a better perspective on what I experienced and I'm finally ready to get back to training and looking forward to the next season! Sounds like you learned a lot and had fun too!!! Cheers to the 2016 season! !